As the world’s growing population demands an increase in food supply, seed companies are looking for an edge to boost the potential in each seed they produce. This puts a great amount of responsibility on seed conditioning plants like the Remington Seeds seed corn production plant in Hastings, Nebraska. With the concentrated amount of scientific research and engineering that goes into each seed, it is imperative that the chemistry application, blending, and documentation systems are all working together to maintain the value of the finished bag of seed. The Remington Seeds plant consulted Popp Engineering of Ames, Iowa to come up with a seed treating, refuge blending, and data acquisition system for the plant. Remington Seeds has quickly become a leader in seed corn production. The Hastings, Nebraska plant is responsible for providing the Midwest farming community with seed corn that is planted in multiple states. The client’s growth has generated a need for state-of-the-art systems that fit within their physical and logistical objectives. “We have an unmatched understanding of our customers’ needs because of the close relationships we have with our clients and our exclusive focus on the seed industry.” Said Jon Popp, President of Popp Engineering. Popp Engineering worked with their clients’ owners and operators to develop a site-specific plan. The plan was brought to life over a six-month time period with completion in September of 2017. 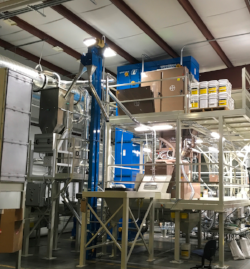 The new system allows the Hastings Nebraska plant to run their product through two parallel treating, blending, and chemistry handling systems which can be operated simultaneously and independently on different lots or can run at double production on a single lot. Increased efficiency of data transfer, record keeping, logistics, and through put were a few of the most impactful outcomes.